Patients must quit smoking: Smoking cessation is paramount for individuals considering body contouring after dramatic weight loss, says Dr. Lintner. The effects of smoking can lead to complications during and/or surgery, so the plastic surgeon recommends for patients to quit six months (or more) prior to surgery. Patients must be in good health: To ensure safety, Dr. Lintner stresses that patients must be well enough for surgery and not suffering from any chronic health conditions such as diabetes or heart disease. A proper diet is necessary: Many patients seeking body procedures have lost weight due to bariatric surgery, which can lead to protein or other nutritional deficiencies. According to Dr. Lintner, these deficiencies must be addressed prior to surgery in order to promote successful healing. In addition to these prerequisites for surgery, Dr. Lintner says patients are often curious if there is a specific weight requirement for body contouring after massive weight loss. 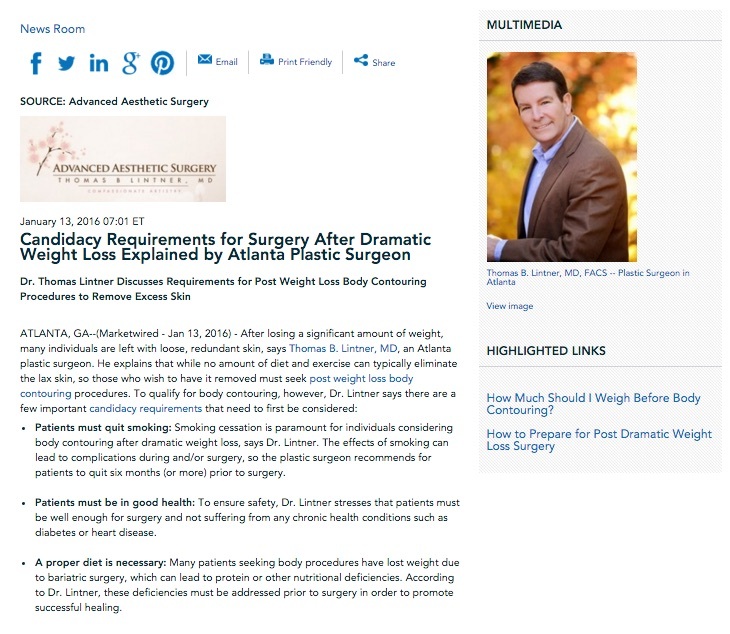 “There is no magic number, but you should be as close to your ideal weight as possible,” he affirms, adding that patients must also maintain a steady weight prior to surgery. The Atlanta plastic surgeon states that having realistic expectations for the outcome of their procedure is crucial, as well, noting, “Although post weight loss surgery can eliminate lax skin to give you a more defined silhouette, it is important to keep in mind that there will be scarring involved.” He explains that while every effort is made to conceal scars, they will still be present. Dr. Lintner advises anyone interested in body contouring after dramatic weight loss to consult a board certified plastic surgeon who is experienced in techniques such as abdominoplasty (tummy tuck), face and neck lift, panniculectomy, posterior body lift, arm lift (brachioplasty), and thigh lift. He says a one-on-one consultation with the surgeon can also help determine if body contouring is appropriate and safe for one’s unique needs and goals. Board-certified plastic surgeon Dr. Thomas Lintner is the Medical Director of Advanced Aesthetic Surgery, his private practice in the Marietta and Atlanta area. He offers a variety of cosmetic and reconstructive procedures for the body, breast, and face. Dr. Lintner is a Fellow of the American College of Surgeons, and he maintains active membership in several prestigious organizations such as the American Society of Plastic Surgeons, the American Society for Aesthetic Plastic Surgery, and the Georgia Society of Plastic Surgeons. To learn more about Dr. Lintner and his practice, please visit tomlintnermd.com and facebook.com/tomlintnermd. Dr. Lintner is available for interview upon request.